The UK’s largest current account provider, Lloyds Banking Group, has said problems with its online banking service have now been resolved. Some Lloyds customers had faced “intermittent issues” on Monday when trying to log on to the online system. 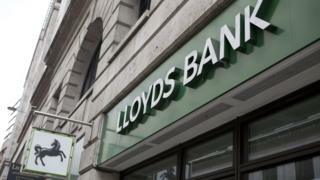 But Lloyds says the issues have now been remedied. “We apologise for the disruption some customers experienced today,” the bank said in a statement. It has 10 million account holders, 60% of whom use digital services. The problems did not affect app services, which were working normally. Services from Halifax and Bank of Scotland, which are also part of Lloyds Banking Group, were also unaffected. A number of customers of Lloyds took to social media to question what was happening. Last month, hundreds of thousands of Lloyds, Halifax and Bank of Scotland customers were unable to make payments from their online accounts. Some could not pay and transfer money online, while others were not able to confirm whether funds were arriving in their account.